Bisphenol A is the pollutant which suspected of damaging our health by engaging in the hormonal balance and manipulate the hormonal effect. In contact with Bisphenol A we come almost constantly in our daily lives. Today we want to give you a list of tips that will help us to control the use of Bisphenol A. Food must not come into contact with Bisphenol A. To ensure our food are free of bisphenol A, we should omit packaging polycarbonate and cans with epoxy coatings. The packages, which are designated by the recycling code 7 (“other plastics”), are mostly from Bisphenol A – containing polycarbonate. Sometimes you wear alternate designations like “PC”, which is short for polycarbonate. Pay attention to recycling codes on the packaging. Plastics without any indicator should raise our concerns: these you should rather leave on the store shelf. Better choice is always a designated pollution-free packaging or containers made of glass, ceramic or stainless steel. Recycling code 3 represents PVC. PVC is one of the substances which cause concern for our health and for the environment. PVC may contain not only Bisphenol A, but also toxic vinyl chloride and phthalate (plasticizer). Recycling code 7 or abbreviation “O” is code for other things among which is polycarbonate, acrylic, polyamide and other materials. These substances may exert a hormonal effect on the organism.. Recycling code 1 (PET) recycling code 3 (PVC) and recycle code 6 (polystyrene). These materials do not contain Bisphenol A. However, they may contain plasticizers, which is said to have hormonal effects. Recycling code 2 or 4 are Polyethylene. These materials are free of harmful substances and safe. From them the cling film is produced which is suitable for packing of food products. Recycling Code 5 is Polypropylene. Plastics with this code are equally problematic and can come into contact with food. A visualization this indicator find you at the following: What everywhere Bisphenol A plugged. Food should not be heated in plastic containers. High temperatures favor the release of harmful substances from the containers. For their storage heated food shouldn’t be cooked first. 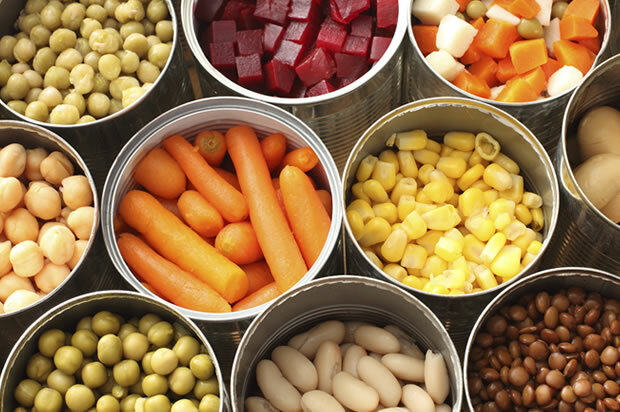 The coating of food cans often contain Bisphenol A, which can get into the canned content and burden him. Therefore, we should manage our consumption of canned foods with concerns. Infants and children should eat all without canned food. Ask the dentist about Bisphenol A – containing dental materials. Among many products which can be charged with Bisphenol A, are also dental materials such as fillings or seals. For this reason it is advisable to find out at the dentist with detailed information before treatment in terms of dental materials used. In order to have the certainty that no harmful materials are used in our mouth, we should see a holistic of dentist working. Protect infants against Bisphenol A particularly well. Under no circumstances should you use baby bottles made of polycarbonate. A healthy alternative to this are baby bottles made of glass. In no case hot water shouldn’t be heated in plastic containers. Food from cans and canned food should not be given to infants and children. These containers can be coated with epoxy (epoxy is Bisphenol A to the content). One should pay particular attention to study the marking of packaging for baby food and the packaging omit, which have either no license plate, or are marked “PC”, “O” or “7”.